London is in the middle of a monumental metamorphosis, as anyone who lives here knows. 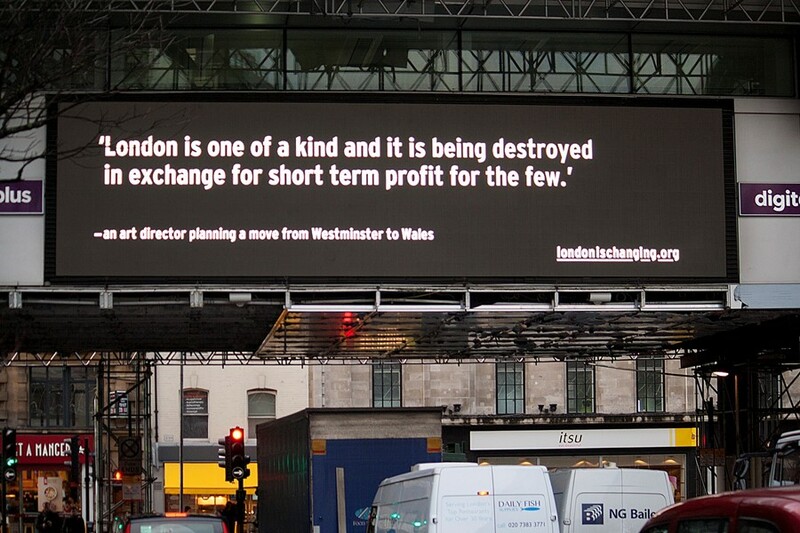 Whether it's astronomical rent prices, the Canary Wharf-isation of every area in sight, or the growing economic divide between the UK capital and the rest of the country, it's apparent that London is becoming a monster. Basically, some can live here and some can't. How is this shift affecting the people who still call this place home? 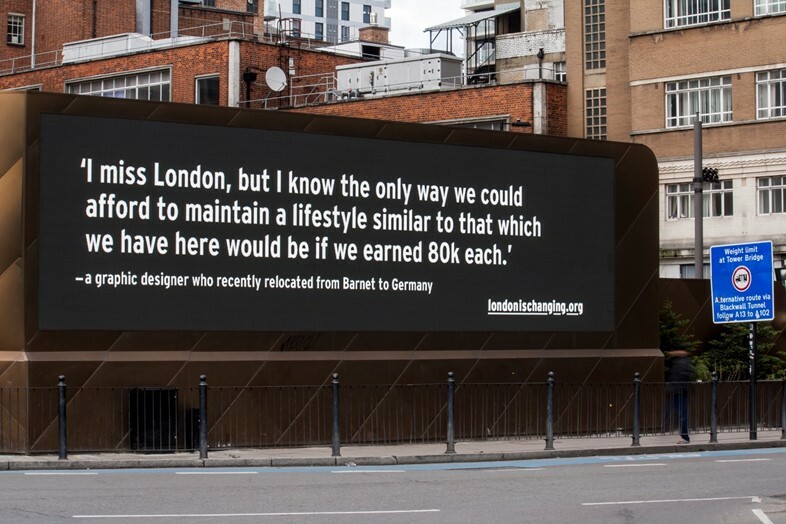 Rebecca Ross, the Communication Design Course Leader at Central St Martins, and her assistant Duarte Carrilho da Graça have created a project called London Is Changing, a public artwork using two billboards in Holborn and Aldgate that tell the story of those Londoners that have fled the city after being priced out, those still here that fear for the city's future and a few that still feel the love. Speaking to Dazed, Ross said: "I wanted to frame a response to the socio-economic changes in London using this medium to try and facilitate a city-wide conversation about an issue that I think is on everyone's minds but doesn't always get studied or reported on in the right ways. I wanted to put it on the street at a large scale in a way that's normally reserved for one-way corporate conversations". Ross is keen to stress that this project is intended to highlight change in the city, not necessarily its decline or the notion that it's becoming too expensive. However, she also describes herself as "pretty aware that the people who were going to be most responsive to were the ones who being priced out, who can't afford to be here anymore. Most of the response has been from people who have to leave, but wish they didn't; mostly socio-economic reasons." Ross started living in London around ten years ago and since then she's seen immense change. "The current JLA administration has made planning changes that have flown under the radar and politicians aren't being held accountable for the decisions that they're taking," she says. 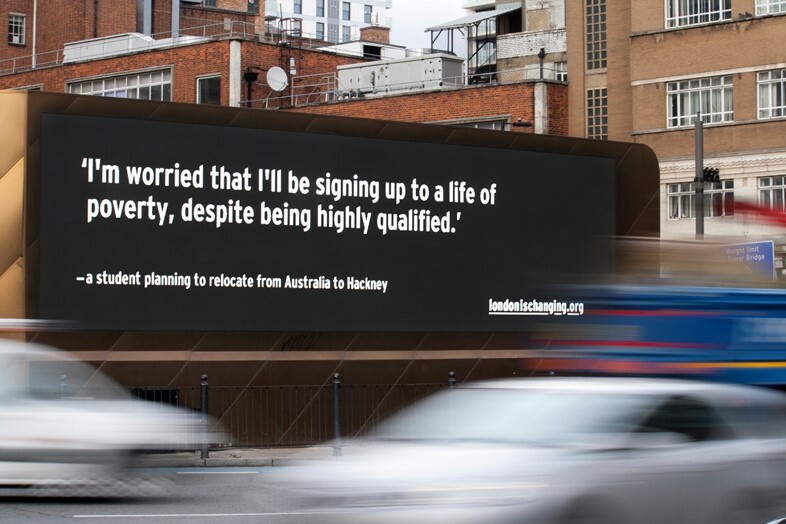 "One billboard said it wanted to be an SOS to the city. I hope we have better discussions - there are conversations happening between government and businesses and then there are separate conversations being had between people who are not experts and just want homes. They should be entitled to have homes in the city that they work really hard and contribute a lot." Even though she says she loves her working life and has a secure job, she worries about herself and so consequently about other people. "If two lawyers can't afford a two bedroom flat, then where do the people who clean their offices stay?" What are your thoughts on London? Land of endless opportunity, or wheezing, magnate's metropolis close to the end? Leave your thoughts below or submit your text to the project here.